But before we went I captured a recumbent cyclist who mistakenly imagined he would get through Motueka without my spies reporting him to me. His name was Eddo Kloosterman and you will immediately deduce that he was Dutch and from that further deduce that he was eight feet seven tall. Why are all Dutchmen oversize? Our children had a Dutch teacher: she was eight feet seven too. In fact you can show me any person on the planet and I will immediately be able to tell you whether they're Dutch or not. and bless my soul, in perfect English too. Unfortunately this availed me nought because when any tourists arrive I turn into Mr Local Knowall, telling them where to go, what to see, and making up all the bits I don't know which is most of them. Eddo was riding a high racer. It had 26/26 wheels but it had rear suspension, the pivot being roughly in the centre of the machine so that the front wheel imagines it's on a leading link and the rear wheel imagines it's on a swing arm and that way you remove half your suspension units. I tried to take a picture but could not bring myself to ask him to remove his camping kit so here it is with luggage. My wife has just pointed out how it appears that he has stashed half of a person under the seat, so if anyone spots the upper half of a Dutchman, or perhaps a fairly short hitchhiker, somewhere on the road from Picton, then maybe they could let me know. 2. Mr English currently favours hard frame twentyniners. For us fogeys, these are 700c rims with Schwalbe Racing Ralph 2.4 inch tyres on built as gentlemen's mountain bicycles, and the large wheels bound over irregularities like a lithe mountain goat and the only suspension is fat tyres run at 20 psi and the whole doesn't weigh very much. 3. Mr English and Mr Knight concur in that gentlemen's mountain bicycle races are won going up hills rather than down them. A 5% saving in time due to low weight going slowly up a hill is better than a 5% saving in time due to good suspension coming down the hill. Mr English is a graduate engineer and Mr Knight is a graduate mathematician so it's the sort of thing that they would calculate. 4. Nevertheless Mr English's tactic on a time trial is to pedal as hard as he can up all of the hills and as hard as he can down all of the hills and as hard as he can on all of the flat bits. It lacks sophistication but wins races. 5. Mr English suggests that I could tension the synch chain of my tandem by cutting the bottom tube, making a very strong tube clamp, and standing on the frame and bending it down slightly. This is how the Bike Friday tandem is tensioned. I discreetly removed my hacksaw from the workshop after this part of the conversation. 6. While setting up new bikes he bungs all the little bits of new chain in a tub for when civilization collapses. I think we all do this. I think we're all thinking 'what can't you make in your back shed?' and the answers always come back the same - chains and tyres. 7. No bicycle seat is comfortable. You just have to get used to them. 8. High racers have Issues. I'm not sure if this is a Mr English remark because the only reference on the envelope is Nisbett Fleming Chartered Accountants & Business Advisors, and though I'm reasonably certain our accountant isn't in the habit of proffering recumbent design guidelines, it might be an outdated note I've nicked off Ye Olde Internette. Anyway the note goes on to say 'uneven weight distribution of front and back wheels; & eyeball jiggles from no suspension.' The former would echo my experience with the first low racer I built and rode furiously round the right-angles in Baxter Gate in Loughborough in the hope of impressing all the dopey bystanders. 60% of my weight lay over the front wheel and when cornering hard, the back wheel lost traction and would skip sideways across the tarmac. 9. 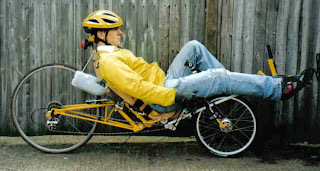 My recumbent bike is wonky. I got him to have a go, and noticed it wasn't just the seat which is what I knew was wonky. The wheels are a good inch out of true with one another. I don't care, however. Wonkiness can't be felt on a 57 inch wheelbase until the speeds get far higher than I can manage. Yesterday I made a huge advance in Science and they're going to give me the Nobel Prize. I have discovered the smallest particle in the universe. The best broom is made of broom and no doubt that's why it's called broom, unlike quarks. What goes through the mind of a physicist when he calls a small particle after a soft cheese? What you do is steal a manuka tree, cut three stems of broom 914.4 mm long, and with the strip of inner tube lash the thick ends to the manuka stick. Behold! a broom. And with this broom you can remove glass from any pavement with a single dazzling swish, and if there happen to be motorists a-passing at the time you can usually spray their paintwork with a hailstorm of road grit at the same time, two birds with quite a lot of small stones. The broom improves with age as it hardens but when it wears out you unlash and replace. The manuka handle lasts forever. For sweeping it's about a thousand times better than conventional nylon-bristled yard brooms, which are hard work and don't do anything like as good a job. Don't trust me. Make one and you'll see. Right, I must now compose my Acceptance Speech in Swedish and see if I can borrow the Large Hadron Collider to try to make curd cheese out of drunken motorists' brains. This exchange requires so much discussion I can only deal with it in note form. 1. Fancy anyone calling Rob English 'Honey'. Amazing. 2. Actually that sentence is easily reversible. I shall try it next time he calls. What d'you suppose are the chances he'll ever drop in again if he suspects I'm about to call him Yoghurt? Lucky he doesn't read this blog. 3. 'Vegan' versus 'yoghurt'. It was soy or coconut milk yoghurt - I didn't check - didn't have time to check - the appetite of Rob English is famously voracious. 4. Rob English + food = petrol for ordinary people, or something. The man eats like he propels people along the road on the back of his tandem at 25 mph. 5. Rob English full? It happened (for the record) on Wednesday 6th January 2010 at 8.17 a.m. Innocent children will be compelled to learn the date in history classes yet to come. 6. He looked longingly at our Toblerone. We all had to check the box to see if it was suitable for vegans. (It wasn't.) Did you know that Toblerone has a Careline? If perplexed by prismatic chocolate you can Freephone 0808 1000757. Thoughtful, aren't they? 7. Terry's Chocolate Orange has a Careline too; it's 0808 1000878. 8. They're both owned by Kraft these days so I expect when the 757 lady puts down the phone she picks up the 878 one. I shall try it to see. I shall first ask her why her huge chocolate bars are triangular, and when she has satisfied me in that regard I shall promptly dial the 878 one and ask why her huge chocolate bars are spherical and we'll see how dextrously she deals with the discrepancy. 9. They both have GDAs. This stands for Guideline Daily Amounts. The Toblerone one says 'GDAs are average values. Individual requirements may vary.' You bet they may. Blimey. Ever seen Dr Dayah get into his Ferrari? Like squeezing a jelly into a condom. His daily requirements must be planetary. Unless he's recently burst. 10. The Terry's Chocolate Orange only gives the GDA for Adults (UK). Maybe the Careline's for Adults (foreign) and they have a list as to what Bulgarians and Spaniards require. And in case you don't think people really are that obsessive, my brother's wife fixed a card to her handlebars with all the different gear ratios of her new Dawes Galaxy written on it, and she used to crash into milk floats trying to work out whether she was in third (rear) and second (front) and whether she was therefore supposed to fiddle with the left or the right lever. It was wonderful riding with her. She'd read Richard Ballantine too (I gave her a copy) and religiously held to his command to keep to low gears, so her legs were like bees' wings when she pedalled. I loved going for a ride with her. Pedestrians would stop what they were doing and watch as she went past, knees fairly humming and her big thick spectacles fixed on the gear levers at a furious five miles an hour. Right, I sh'll'av't' see if I can find all the other envelopes with things that Rob English said, apart that is from 'We're doomed' which I learnt by heart and didn't need to write down, though actually it's what everyone I know is saying at the moment. Must see if that book Overshoot by William Catton is all it's said to be. Mr English of the parish of America has come to visit and I am very surreptitiously sneaking onto my blog, which I can do because I happen to know he doesn't read it. b) through some oversight they didn't publish his banns of marriage in the parish of Motueka. Matter of fact last time I was in church there were no banns of marriage; it was the carol service which is essentially Motueka Brass Band versus the Congregation, and on the whole the brass band wins. Arsenal subdued West Ham, I heard on the radio (they actually broadcast English football results in New Zealand. Incredible but true.) so I suppose Motueka Bass Band subdued Ngatimoti which is where the carol service is held, a pretty wooden church with an improbable pair of Stokes mortars guarding the war memorial. One gets to inspect the Stokes mortars afterwards cos it's midsummer and they're outside. No shortage of armpits at Ngatimoti carol festival. So Mr English turned up on a Bike Friday tandem and natch I had to have a go, and since Mr Knight was staying here last week and he and I rode my tandem up the valley and back (18.8 miles) in 53 minutes, which is two minutes faster than I can manage on my recumbent bike, I was curious as to how it would compare. 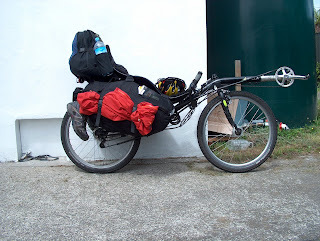 the Bike Friday tandem weighs a meagre 27 lbs. 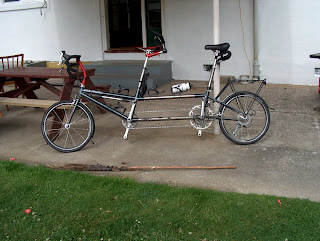 Rob English's Bike Friday tandem is svelte. Unf. I happened to mention that I wanted some comparative figures so the wretched fellow put on the power as if it was a time trial and we managed it in 46 minutes. Though after about four miles I was almost retching with exertion so maybe the 'we' bit of that sentence is a conceit. Puking aside 'tis a springy joyous ride, just enough bendiness in the frame to absorb road shock; not enough to confuse it with a Bickerton. However there was a suspiciously black mark on my inside right calf afterwards & I entertain a suspicion that Mr English uses inappropriate substances on his chains. I think he does not follow the One True Religion, that of the chain-waxers. The only reason he isn't being burnt at the stake even as I write is because he showed me a way to loop the cable safely on my Flymo. Shan't say how though, cos I like to hear about everyone else having eloctrocutory excitement while lawn mowing. We have had visitors, a Mr and Mrs Charles & Elizabeth Knight of Olney in Buckinghamshire. For the benefit of those to whom English is a second language, the pronunciation of Knight is Nite and the pronunciation of Olney is Oh Knee and the pronunciation of Cowper is Cooper. - And while we're about it the pronunciation of pronunciation is pronunciation. My children have had a succession of primary school teachers who insist on teaching them, actively teaching them, to say 'pronounciation', but they resisted, referring the relevant teachers to oh, just about any English dictionary at all in support of their insubordination. - I mention Cowper because Mr Bob Knight of the parish of Rangiora, once lived in Cowper's house in Olney. He kept hares amid bouts of insanity. Cowper, not Bob Knight. Bob Knight only keeps penny farthings. Since Mr Knight Snr. is an engineer he spent most of the time fiddling with a certain Wotan shaper which he found behind the sheds, freeing off the ram and elucidating the function of all the knobs and levers with which it is festooned. - I hired a HIAB in the end, at the cost of $250, and it made the moving a painless experience. Mr Macdonald, who is the KiwiHPV newsletter editor, had wanted me to lift it with planks and ropes and pulley blocks and tow it home on a robust bicycle trailer and write it all up for him as an Adventure, but I'd had enough adventures in workshops recently and had no wish to add a squashed toe to my munted eyeball by way of gratifying his machine-tool-relocation fantasies. I found it sitting in our scullery at 10 pm.